Spray 13x9-inch (3-quart) glass baking dish with cooking spray. In large bowl, mix eggs, whipping cream and broth. Add bread; toss to coat in egg mixture. In 12-inch nonstick skillet, melt butter over medium heat. Add sausage; cook 7 to 9 minutes or until browned. Using slotted spoon, transfer sausage to bowl with egg mixture. Add onions, mushrooms and salt to fat in skillet; cook over medium-high heat 9 to 12 minutes or until mushrooms are browned. Stir in garlic; remove from heat. Cool 3 minutes. Stir into egg mixture; stir in cheese. Pour mixture into baking dish. Cover and refrigerate at least 8 hours but no longer than 12 hours. Heat oven to 350°F. Bake 50 to 55 minutes or until at least 165°F in center and knife inserted 1 inch from edge comes out clean. Let stand 5 minutes. Top with herbs. Short on time? You can skip the refrigeration step. Bake uncovered 30 to 35 minutes or until at least 165°F in center and knife inserted 1 inch from edge comes out clean. We tested with bagged, preshredded white Cheddar cheese. So feel free to save time shredding, and choose the easier option. When cooking mushrooms and onions, remember that color equals flavor. If you get them meltingly soft and deeply browned, they will add considerably more flavor than if they are just barely tender and lightly browned. Fresh parsley, chives and thyme add a beautiful finishing touch and loads of flavor as well. But if you need to save time or you have trouble finding all of the herbs, you can leave one out. There’s no need to add more of the others. In our test kitchens, we love using the pre-peeled vacuum-packed garlic available in the produce section of many grocery stores. The vacuum sealing maintains freshness and quality, and it’s a great time-saver. When shopping for mushrooms, look for mushrooms with firm caps, good color, no soft spots or decay. Store mushrooms unwashed and wrapped in paper towel in a plastic or paper bag. They’ll keep in the refrigerator for up to four days. Wash mushrooms right before using. There’s a lot of conflicting advice out there about how to clean mushrooms or whether you need to. Whatever you’ve heard, you must clean mushrooms. They grow in dirt and regularly have more dirt on them than any other vegetable at the grocery store. The best way to clean mushrooms is by submerging them in a bowl of cold water and wiping off any remaining dirt with a soft towel or sturdy paper towel. Your mushrooms will take on a negligible amount of water, if any at all, with this cleaning method. Removing mushroom stems can make them easier to clean and cut. If you like to leave your stems on, trim the ends before cleaning to freshen them up—the ends tend to look bruised and dark. This recipe was inspired by our love of bread pudding, which typically includes cubed bread mixed with milk, egg, sugar and spices. 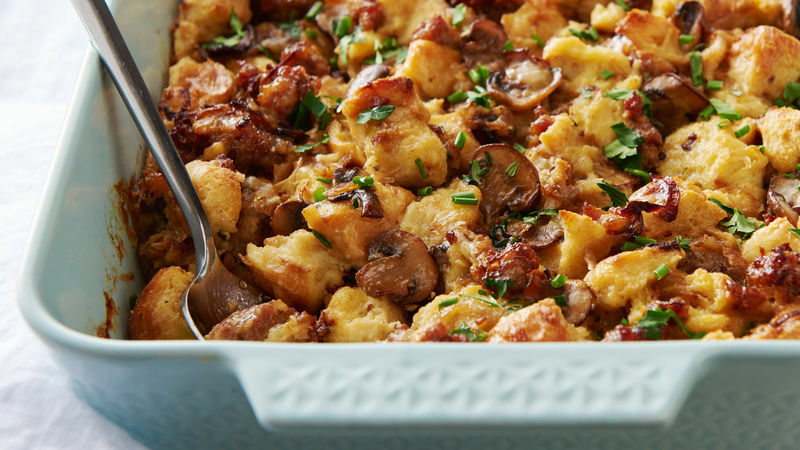 This savory spin also reminds us of Thanksgiving’s most beloved dish—the stuffing—and since it features breakfast sausage, it also brings to mind a strata—another bread-heavy baked dish that includes eggs and cheese and is often served at breakfast or brunch. So whatever you want to call this dish, you can be assured it’s as delicious as the dishes that inspired it!